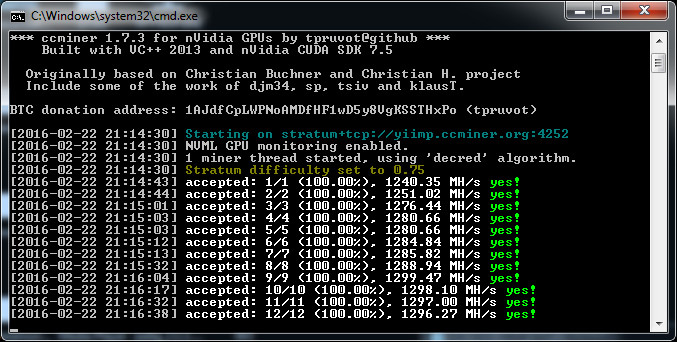 A quick update with a new Windows binary compiled from the latest ccMiner 1.7.3-git fork from tpruvot (source) with some improvements regarding the Decred (DCR) that uses a bit different Blake256 14-round algorithm. This release supports Decred mining with both the traditional getwork implementation as well as the getwork over stratum support that yiimp and some other pools have already implemented. 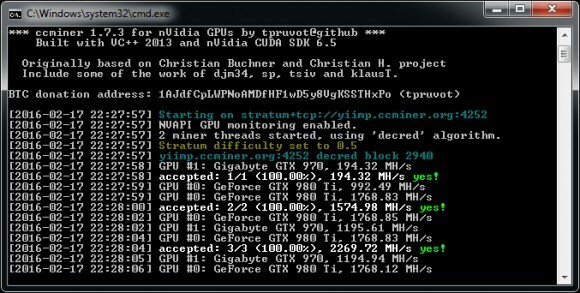 The release below includes two versions of ccMiner, one is 32-bit binary for Windows that is compiled with CUDA 6.5 and with support for Compute 2.0 or newer Nvidia GPUs, and another that is 64-bit Windows binary compiled with CUDA 7.5 for Compute 3.5 or newer Nvidia GPUs. Do note that if you have a newer Nvidia video card you should use the 64-bit CUDA 7.5 release as it is providing better hashrate than the 32-bit CUDA 6.5 binary. Below is a quick comparison of the performance of the two versions on a Gigabyte GeForce GTX 970 WF3OC GPU running at stock frequencies. Tpruvot, one of the ccMiner developers has released a test version of his fork with Decred (DCR) support with getwork over the stratum protocol (source) along with the needed support for yiimp (source), his fork of the yaamp multipool software. We have compiled a Windows binary from the test version with Decred support and getwork over the stratum and have tested it on yiimp.ccminer.org to see how well it is performing. The result was just as you would expect from any good mining pool with stratum support – no stale shares and properly working difficulty adjustment. This version also comes with the regular getwork support, so it will work with the regular Decred mining pools as well. You are welcomed to try mining Decred on the Yiimp pool with the test version of ccMiner 1.7.3 form tpruvot, the Windows binary below is a 32-bit one, compiled with VS2013 and CUDA 6.5 and it should be compatible with older Compute 2.0 or later Nvidia GPUs plus a 64-bit one with CUDA 7.5 for Compute 3.5 and newer GPUs. Update: The Decred (DCR) mining pool at Suprnova (https://dcr.suprnova.cc/) now also has a stratum enabled port that will work with this miner, so you can test it there as well if you are mining Decred with Nvidia GPUs. Download again for the latest updates that should help resove issues people are having with stratum on Suprnova.